I turned 55 this year and wondered with astonishment how I got here—more than half a century has flown by. Even when I shake my head or squeeze my eyes shut, there is still the fact that I’m 55 and getting older every day. As I travel on my journey through life, there’s a lot in my personal rear-view mirror, but more important, there’s even more outside my windshield. 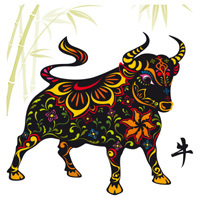 According to the Chinese zodiac, I was born in the Year of the Ox. My personality is known for diligence, strength and determination. Lucky for me (and certainly something in my DNA), I have ideals and ambitions in life with a great attachment to family, work, and education. Yep, sounds just like me! After the birthday shock eased, a new realization set in with determination: I can still do anything I want to do. There is no one to slow me down (isn’t that a song?) and nothing in my path. The question I needed to answer became very clear: “So what does the next 10 years hold for me?” I realized there’s not a minute to spare. Looking forward is all well and good, but I now need a plan to make something of The Next 10! As I am happily married and would like to stay that way, I needed to loop Dan into my new revelation. He was more than willing to play along. S0, my wonderful husband and I took stock of where we were—everything from where we lived to our financial picture to our jobs; and of course, to what our darling daughters were up to. Then, we sat down and asked ourselves a critical question: “Do we still want what we have?” The answer was yes and no. Some things we wanted to keep, but others felt like a burden. We also knew that there had to be something new and exciting “out there” waiting for us. It took some time, but we figured out that we were looking fora little adventure, something different. Keep in mind, we’re not the athletic types who want to climb the highest mountains, compete in triathlons, or walk across America. There’s no camping, mountain biking, or heli-skiing. But, we’ve never lived in the “country” and thought it might be fun to wake up somewhere different every morning. After 25 years in our cute house on a postage stamp lot, we started house hunting and exploring towns within a 30-mile radius from our home base. The reality was that we both have to work and we need ready access to Boston, so we couldn’t stretch too far geographically. Once we started looking into a new area, it was amazing and fun what we found! Announcement of the Next 10 Adventure — with moving boxes! It took a while to narrow things down and create our Next 10 Plan: We were willing to move and leave behind the house where we raised our girls. 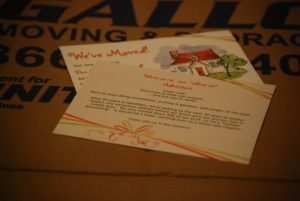 (Yes, this came as quite a surprise to us, since we were attached to our home and town). No, we were not going to take every single thing we owned with us – we were going to toss 50% of the stuff! 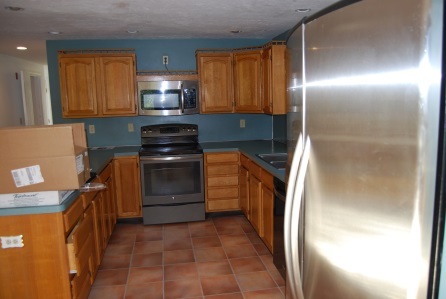 We called it our “limited downsizing” and it was much harder to get rid of things than we thought it would be. Yes, both of the girls would still have their own rooms – after all, the new place was their new home too. No, we weren’t going to get a house that needed any work done. We’ve gone down that rat hole before. And, our house needed to be on a big lot – preferably an acre or so. After all, this change is about a new adventure, a new routine, and exploring new places. With wish list in hand, we set out on the first leg of the journey to find that ideal place. After visiting 30 or more houses over seven months, plus hundreds more online, we finally found our new home. It’s a lovely colonial, about a third smaller than our original house. It has a two-car garage and a shed in the back for hubby’s workshop. It sits on almost an acre in a beautiful country town with farms and vegetable stands not five minutes down the road. Oh… did I mention it’s a total fixer-upper? Blue formica on counters and walls and leaky faucets was not exactly what I was hoping for in my Next 10 adventure kitchen. What’s that Rolling Stones song? “You can’t always get what you want…” Sometimes you just have to run with the adventure. So, we said, “What do we have to lose? We’ll fix ‘er up with exactly what we want and enjoy it while we’re here.” That’s exactly what we’re doing. Just the two of us, the painter and his crew, the electrician, the plumber, the tiler, the cabinet guys…our own mini-workforce! Through all the dust and dirt, we try to remember that the new house in the new town with a new routine is exactly what we needed to shake things up. It will only take some diligence, strength and determination. Good thing I was born under the sign of the ox! This is the beginning of “The Next 10” as we’re calling this era of our adventure. It’s the window between 55 and 65 that we want to fill with cool stuff to do and interesting places to explore while still working. It’s a transition time, but maybe it’s more like a change in our daily routine that had become, honestly, too routine. We’re still at our same jobs, involved with our girls, and planning for holidays and other traditions that are so important to us. We are simply doing it all from a new location that makes everything fresh and exciting. While talking about this “pre-retirement” phase with a dear friend, she said, “Hey, you’re now an “empty-nester, not retired” couple.” For a while in the 1980s we were DINKs (dual income, no kids); then we were “working parents” (exhausted); and now, we’re ENNRs (empty nesters, not retired). I like it. It screams “adventure” to me! I’ll keep you posted on our reno progress and new adventures. You can do the same. Share your ideas for fun and adventure. What kinds of adventures are you having in your “Next 10”? « Ladies: How Big Is Your Freedom Fund?